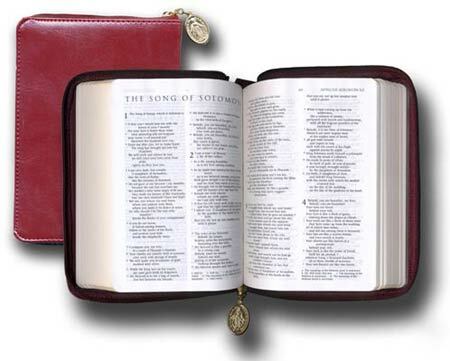 Catholic Bibles: Contest: For International Readers Only! As promised, I am going to offer a contest for those of you outside of North American. I have promised for a while that I would do this, now I am very happy to offer this contest. 1) You must live outside of North America. 2) You can enter only once. 3) If you have a blog, please advertise this contest on it. "What is your favorite Bible verse? Why?" You must do this in 3-5 sentences. 5) Entries must be in by Saturday, 11:59 PM EST. 6) I will announce the winner on Sunday. That person has one week to email me their name and address. This section is by my meaning the best prove against the so popular "sureness" of the Salvation. At the beginning each of us get the lamp, but only the one, who lives the Christian live and his faith is alive, will enter the Kingdom. This section leads us to humbleness and all catholic way of Christian live - be all the time prepared for Christ´s return. My favorite verse is Lk 10:12, "I tell you, it will be more tolerable for Sodom on that day than for that town". The verse has somehow the effect of leveling the playing field. As a christian, one has the duty to go and preach the Good News. But one has to bear insult and contempt only up to a point. Once the Message has been proclaimed, it is up to the audience to receive it or not. And if they willfully reject it, they do so at their own souls peril. My favourite verse is Mark 10:21 "And Jesus looking upon him loved him..." I identify with the rich man in that I know despite my best efforts whenever I present myself to the Lord in prayer I am lacking in one way or another. Nevertheless I feel the Lord looking at me, smiling and loving me and it fills me with joy, hope and the resolve to follow the Lord even more closely. PHILIPPIANS 4:13 "I can do all things in him who strengthens me"
I can always turn to this verse when feeling down or struggling with something in my life. It's great encouragement and fills one full of hope, that if we trust everything to Our Lord Jesus Christ, we can do all things. My favorite is Acts 20:35 "...Keep in mind the words of the Lord Jesus who Himself said 'It is more blessed to give than to receive.'" I like this verse because its a beautiful saying of Jesus not in the Gospels, but passed on to Paul by the Apostles. That verse reminds me of my childhood, and that psalm is very easy to visualize our relationship with God. there is nothing I lack". It reminds me of childhood. That Psalm is very easy to visualize and it is very simple to understand its message. Sorry for the two responses. T meant the firs, but after a few clicks I was not sure of the sending of the response, then I wrote the second. "Do not wear yourself out to get rich; be wise enough to desist. In a world nowadays where money is the major competitor of God in human living, thees verses is a reminder to us that money is nowhere permanent and it will not surpass anything that God can provide while money can't buy everything. James 2:26 "For even as the body without the spirit is dead; so also faith without works is dead." is not enough without works. And it warns me that I have to do my best in every situation. During the exams I had anxiety, and I wasn't able to concentrate for the sudying. One day I was reading daily verses in the Bible, and it was the last verse for that day. It gave me peace and hope, so I was able to study again. That's why it is my favourite Bible verse, it helped me in the bad days.